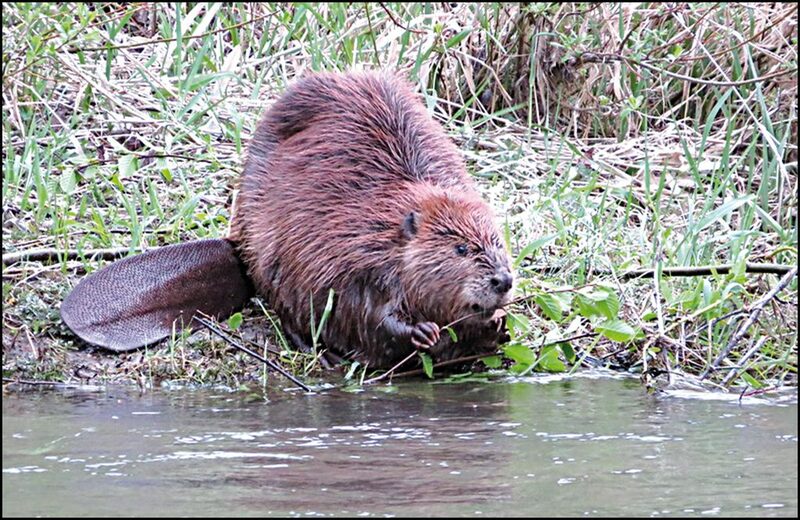 In our first “Creature Feature” in the Chewelah Independent, we decided to feature the North American beaver, who sometimes resembles a logger and we have lots of loggers in Chewelah, right? The beaver is nocturnal, semiquatic rodent and at one point there were 60 million of these web-footed rodents roaming around. That number is probably around 12 million nowadays due to a population decline from human removal. Beaver pelts were prized, as were beaver glands for medicine, along with people becoming annoyed that a beaver would clog up a creek and flood their field. Anyone who has been up to Browns Lake is probably familiar with the famous beaver dam that seemingly separates the front and back part of the lake. Beavers are known for their sharp teeth which can do the same job as a Stihl chainsaw if given the time. Beaver’s teeth keep on growing so constant knawing is needed to keep them in check. Their eyesight, however, is much to be desired and they’re more reliant on their sense of smell and hearing. This probably is because they are nocturnal. According to scientists, giant beavers that could have been as large as seven feet existed until 10,000 years ago. Their smaller modern day version is still a marvel to behold. Beavers can create dams that cause creeks to flood surrounding wetlands. While this is bad if you’re a farmer, it’s a good thing for some aquatic species which rely on the dam’s created habitat. Meadows created by beaver dams can also feed deer and other animals. Their dams can also provide protection for young salmon and trout. Beavers make their dams out of wood, mud and rocks. They’ll chew down small trees and may even dig a canal to float trees back to their pond. Their webbed feet make them excellent at swimming. They warn each other by slapping their wide tails on the water. You may have remembered doing this with a canoe paddle at Browns Lake, only to get the same reaction from a beaver’s tail in response. Thankfully for those swimmers at Browns Lake, unlike their massive ice age companions, today’s beavers can only grow to three feet and 40 pounds. No massive legendary horse-beaver will be roaming that Chewelah watering hole. Beaver lodges are the luxury condos of the animal kingdom. They can have multiple entrances and an above-water den. The entrance usually requires swimming under water (you may have seen some westerns where the hero swims into a beaver den to avoid the bad guys) and have “skylights” or small holes near the top of the lodge for fresh air. Colonies of beavers can grow to up to a dozen beavers and several lodges. When the beavers have consumed most of the food and the closest trees from around their dam, they will begin looking for a new home. An abandoned beaver dam will deteriorate, and the flooded wetland recedes, revealing a meadow with rich soil. In the winter, beavers store food for the cold season at the bottom of their pond, or swim under the ice to harvest plants. Beavers can hold their breath up to 15 minutes, making them better swimmers than Michael Phelps, probably. They don’t hibernate, however, and they can live up to a quarter of a decade. The beaver is Canada’s national animal and our neighbors to the north made that designation in 1975. The U.S. Forest Service’s Forest Features was a big source for this article.